With Vin Scully’s incredible 67-year run as a broadcaster for the Brooklyn and Los Angeles Dodgers coming to an end, one of his more inspirational stories involves his Fordham Prep classmate Larry Miggins. In 1952, Miggins was a reserve outfielder for the St. Louis Cardinals and Scully was splitting broadcast duties with the legendary Red Barber. During a 2013 interview with Miggins, he explained to me how the Fordham Prep alumni crossed paths at the major league level in a most unlikely way. 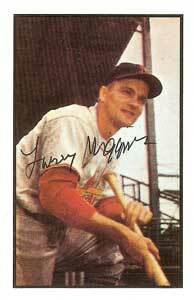 During the 1952 season, Miggins found sparse playing time behind two Hall of Famers in the Cardinals outfield, Stan Musial and Enos Slaughter. As the Cardinals started a 16-game road trip, manager Eddie Stanky gave Miggins a rare start. His spot in the lineup on May 13, 1952 set the stage for Scully to earn his stripes as a thinly veiled fortune teller. For many years, Scully’s improbable tale of predicting that he would broadcast his schoolmate’s first major league home run was one that he told at a multitude of speeches he’s given around the country. Of the myriad of rich baseball experience that Scully’s had throughout his career, Miggins pondered why his was chosen.